The epitome of a low-tech agriculture solution, these coops on wheels give your birds constant access to fresh food, while fertilizing the soil and controlling pests. The idea is you move a chicken tractor across your pasture (or backyard) every day, or every few days, so your flock constantly has fresh vegetation to forage in. Chickens like to eat the tender tips of grass and weeds, and they especially relish bugs, slugs, and snails – which helps make a dent in the pest population on your property. As you move the tractor around, they leave their nitrogen- and phosphorus-rich manure behind them. It’s called a chicken “tractor” because the scratching action of the birds quickly denudes the ground and loosens the top inch or so of earth. It’s one way to get rid of a lawn or a weed patch in preparation for planting a garden. But if you just want the birds to perform pest control and fertilize your lawn or pasture without turning it into a dirt patch, make sure to move the tractor on a daily basis so they don’t work any one area down to bare earth. The internet is chock-full of chicken tractor plans, with designs that range from ramshackle contraptions cobbled together with used pallets to models that repurpose old cars to sleek, modernist egg-mobiles. Larger models for commercial operations are likely to make use of a mobile home, salvaged school bus, or equipment trailer. You can also purchase a prefab chicken tractor, like these from Smoky Mountain Chicken Tractors that start at $350, or this rustic-luxe model from Williams-Sonoma that’ll set you back more than $2,000. 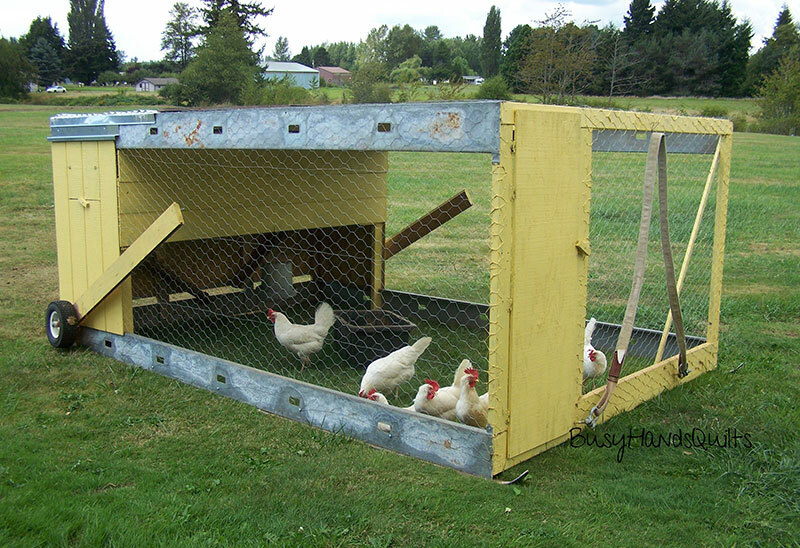 But all chicken tractors are comprised of a few basic components: an enclosed nesting area, a chicken “run” covered with wire mesh to exclude predators, and a frame with wheels so you can pull it around. If you choose to build your own – like these that we found on Instagram – how well you pull it off will depend on the materials you have on hand to work with (or your budget to buy them with) and your engineering (or at least, MacGyvering) skills. Of course a little creativity in the design doesn’t hurt. This is where your birds will lay their eggs and sleep at night. Typically resembling a small shed, the nesting area needs to be weathertight and predator-proof with a door or hatch to access eggs from the outside of the chicken tractor (and give it a weekly cleaning) and a smaller hatch on the opposite side that allows the chickens to move back and forth from the chicken run. The access points should be latched to prevent predators from sneaking in at night. Inside you need a minimum of one 12-by-12 inch straw-filled nest box for every four birds, and 2 square feet of floor space per bird. The nest boxes are typically elevated off the floor of the structure, so part of the floor space allocation can be below the nest boxes. An elevated roosting bar is also a must so the birds can fulfill their instinctual need to sleep off the ground. Plan for at least 8 inches of roosting bar per bird. Hang a small watering device inside the nesting area to keep them hydrated through the night. A feeder is optional, but it’s a good idea if you are not an early riser – chickens are up before dawn and ready to start eating! It’s also wise to include small window openings around the top of the structure for ventilation. Cover these with chicken wire for predator protection, and install a hatch or shutters that can be closed in the wintertime to keep your birds warm. This is where the birds will roam around during the day. The chicken run is open on the bottom for the birds to forage, but completely enclosed with chicken wire on the top and sides for predator protection. Plan on at least 4 to 5 square feet per bird in the run. The nesting structure is often elevated above chicken run, so the birds can forage underneath. If this is the case, you’ll need a ramp (a piece of 2Á—6 lumber is perfect) to provide access to the nesting area – screw thin strips of wood every 6 inches along the top of the ramp to provide traction in wet weather. Elevating the nesting structure also creates a shaded area on one side of the chicken tractor, which is essential and hot weather. You may also wish to provide additional shade by building a roof over some or all of the run (or just strapping shade cloth or a tarp over it), especially if you live in a hot climate. The run should also have an access point for humans so you can close the small chicken door leaning into the nest structure at night – without a solid floor, the run is vulnerable to nocturnal predators trying to dig under the sides. An additional watering device and feeder are optional inside the run if you already have them inside the nesting structure. The chicken run and nesting area are typically built around a single wooden frame, either triangular or rectangular, which provides a structure to attach the chicken wire to. Often, the base of the frame consists of a pair of stout beams which act like skis to slide the chicken tractor across the grass. Making a curved cut along the end of the beams facing the direction in which the chicken tractor will be pulled – imagine the curved front tips of a pair of skis – makes it easier to slide it across the ground (this should be at the lighter end of the frame opposite the nesting structure). Though this isn’t necessary if you plan to mount wheels on your chicken tractor (see below). A heavy-duty rope, cable, or chain is attached to the front end of the frame for pulling, either by hand, or for larger models, with a four-wheeler or tractor. Alternatively, attach long handles to the front of the frame and move it around like a giant wheelbarrow. Wheels or not, the lighter the chicken tractor, the easier it is to move around, so keep this in mind when selecting building materials. Tin roofing panels are a good choice for the roof of the nesting structure, but they may also be used as lightweight cladding for the sides. Instead of building a wooden frame for the poultry wire, consider using much lighter PVC pipes to build a hoophouse-style structure. Wheels are optional on the smallest chicken tractors, but are necessary on larger models. Depending on the size of your chicken tractor, use the replacement wheels sold for lawnmowers (smallest), wheelbarrows (medium-sized), or garden carts (larger) at most hardware stores; the heaviest chicken tractors will require a tire made for a tractor, trailer, or vehicle. A more common approach is to use only two wheels, mounted at the heavy end of the frame where the nest structure is, with the opposite end of the frame resting on the ground. That way when you lift the front end the frame up to move it you’ll have good clearance on that end for maneuvering, while the wheels support the rear, heavier end just off the ground (much like a wheelbarrow or garden cart). Some enterprising chicken tractor designers have come up with ways to adjust the wheel height: “up” for the parked position and “down” when it is time to move it. I am designing my first chicken tractor for 12 – 6 month old layer chickens. I have lots of flying (hawks, owls, ravens etc) and crawling night time predators (weasels, raccoons, skunks etc) that threatened and some, without proof which have killed and eaten some of my chickens in recent years. Is it a good idea to install a steel mesh, like a 4 x 4 for the run area to keep out burrowing and digging critters?